Keeping your children busy with constructive work is the best way to get them sit in one place! But then, it can be a really tough task. It is not always easy to come up with innovative ideas to keep them engaged. We suggest you allot interesting and fun activities that your kid will enjoy doing daily. Coloring is every kid’s well-loved activity. So why not play around with the themes and subjects that you choose for your kid to color? It can also double up as a learning tool for your kid if you so wish! This cute clown is holding an umbrella and dancing. 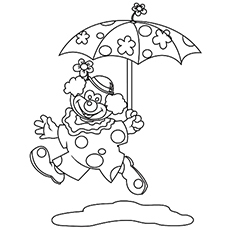 The umbrella has funny floral prints on it and the clown too is dressed to make your kid laugh as he or she colors! This clown, holding a bunch of balloons, has very funny attire. He also has a funny hat on his head as well as a big smile painted on his face. 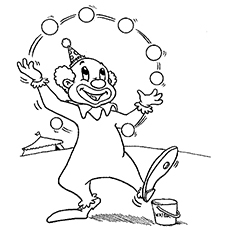 This clown is seen juggling with a number of balls. Clowns at a circus usually juggle and play with balls and entertain the audience with their funny antics. Circus clowns usually wear loud and weird make up. They entertain people with silly actions and speeches. 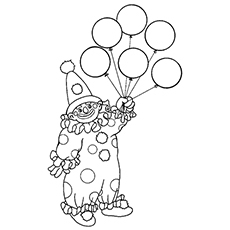 Ask your child to color this funny clown in bright colors. 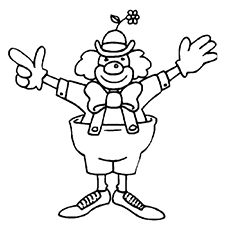 This clown is all set to make its viewers roll over with laughter!Once your kid finishes coloring this page, take him or her to the circus when a troupe comes to town, to see a clown perform his act! 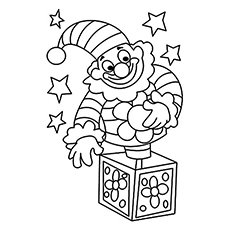 This coloring page features the favorite Jack-in-the-Box! It is a box that has a lever which when turned makes the clown figure in the box pop out, startling the person. Get your kid one and watch him play with it all day long once he or she colors this page! Here we have a group of three clowns. These three are making merry and dancing around in silly movements, holding each other’s hands. 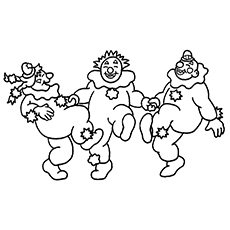 Your kid is sure to love coloring this set of three clowns! This is a great coloring page. 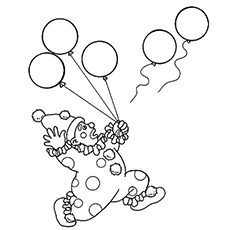 It features a clown who is running after two balloons that have gone loose from his hold! He is trying to catch them but they are flying higher. Your kid will love this page! 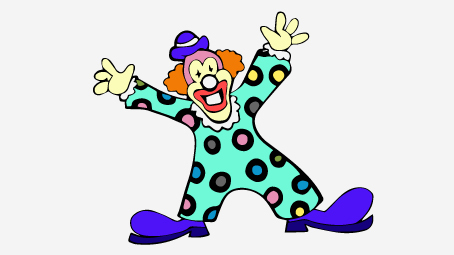 This little cute clown is dressed in the funny manner that clowns usually are. It is an absolutely adorable design that your little one would love filling with colors! This coloring page can also be used as a mask. Let your kid color the page and once done, you can cut out the design, add holes for the eyes and add a string to the cut-out for your kid to wear and have fun! 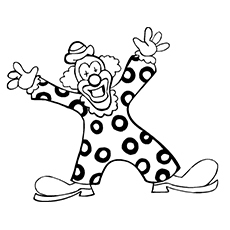 This is our collection of clown coloring sheets. 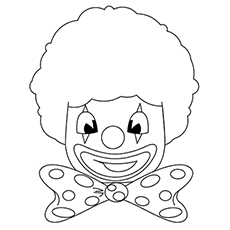 Help your kid color the clown in vibrant colors, in keeping with the usual appearance of any clown. 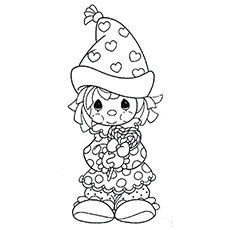 We hope you liked our collection of free printable clown coloring pages. Don’t forget to share your moments spent with your child while helping him or her color the pages. Click on the free clown color page you would like to print or save to your computer.